Way back last year I wrote a post about making a green bath puff… interestingly, this has turned out, to date, to be my single most popular post. For some time, however, I have been dissatisfied because it left things up in the air – I never came to a conclusion about the best yarn to use and I didn’t get great feedback from my tester who tried out my nettle fibre puff. Whilst I have found a great pattern (the brain) the thing that has eluded me is a suitable fibre. The pattern I have settled on is a simple crochet creation: start with a chain about six stitches long; turn it into a loop and starting with the first stitch of the chain, make six to eight triple (I think they are doubles in the US) crochet stitches in each of the original stitches; next work into a new layer, again making six to eight triple/double crochets in each stitch; work one final layer in the same manner and you will have your ‘brain’. Make a chain for the hanging loop and thread this through the central hole in the sphere before tying the ends together. If you don’t crochet, try it – my original version in cotton was the first item I have ever crocheted and was a great thing to learn on. 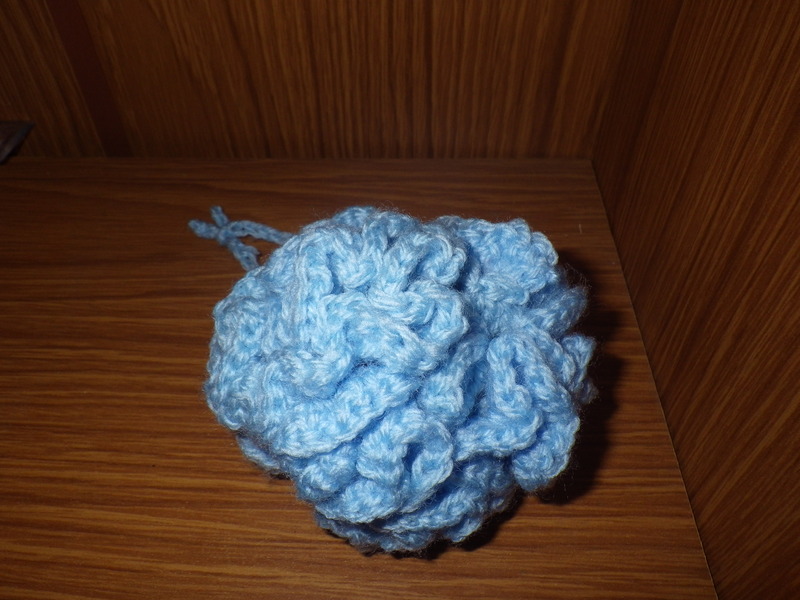 You can use any gauge of yarn and vary the size of the crochet hook according to how open you want your puff to be. I have been fretting about appropriate yarn for months now – searching the internet, examining different fibres and not actually achieving anything until a few days ago. 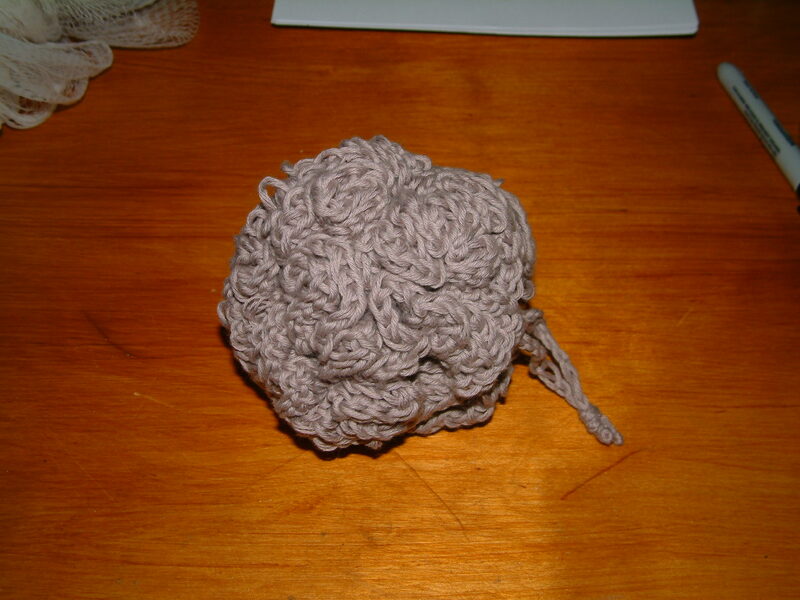 Searching the internet once more, I came across reference to making bath puffs out of acrylic yarn. Now, my original idea was to create puffs from natural fibres – hence my experiments with cotton, nettle, hemp and bamboo – so I had never even considered a man-made yarn. However, as I mentioned a couple of posts back, I have been given some yarn by a friend who had got it from freecycle. Most of the balls were fine gauge sheep’s wool, but there were some knitted pieces that needed to be unravelled (more on that in a later post). Some of these were knitted from acrylic yarn in a double-knitting wool weight… and what could be more ‘green’ than some reused yarn that was destined for landfill? So, a couple of days ago I got out a crochet hook and set to work again. And the result? Well, it’s less brain-coloured this time, but I can report that using it in the shower this morning was a success – lather (not quite as much as with a nylon commercially produced puff) and not enormously absorbent. It’s currently hanging up to dry and we’ll see how long that takes (the cotton ones take days!). I think I might have found the answer… I will just need to start frequenting charity shops looking for acrylic jumpers to convert! Hmmmm, reusing an old acrylic JUMPER……. A step in the right direction indeed. As for the one you sent me. While it was good against the skin, it didn’t lather at all. And absorbed allot of water. Which then took it about a week to dry. Howblonfor this one to dry? I used the new one yesterday morning, squeezed it out and hung it up to dry out of the shower so it didn’t get wet again. By this morning it was just a little damp. It doesn’t lather quite as well as a nylon version, but it’s not bad… I’m working on one for you now. I’ve used both nettle and hemp yarns… they work quite well. may over exfoliate if used to excess!!!! do you stock it? I might give it a go.